Last Friday, two things happened that radically impacted my view of marriage. The first was a quote that a DJ was discussing on the radio. He talked about a tweet someone posted that basically said that the goal of marriage was not happiness, that happiness was simply one of the benefits. Intellectually, I understand this. Marriage is difficult, often full of mountains and valleys, and anyone married for a long period of time will tell you it is not always happy. We look at couples on social media and if they look “happy” in their photos together, we assume their marriage is a good one (and yet, I’ve known couples who post happy pictures, then announce their divorce soon after because those pictures don’t represent the day-to-day fighting and disintegration of their marriage). Even movies and books are always searching for happy. I love Christian romance books, but you are always reading for the “happy” ending, when they suddenly decide they love each other and want to be together forever. Of course, those books stop at the happy ending. They don’t illustrate the craziness of life after you throw in a few kids, pets and a mortgage payment. 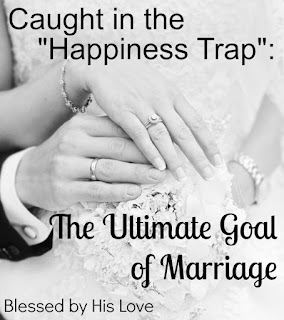 As someone who does a lot of marriage counseling and teaches marriage classes, I should know better than to become fixated on happiness as the barometer of marital success. And yet, I’ve been guilty of this over the past year. We’ve had a busy year – we are helping to start a church plant, we both work, we have a four-year-old who is the most stubborn child of all time, and a lot of travel. It has been easy to shift from “soul mate” mode to “roommate” mode. You know that mode, right? The one where your conversations at night are focused more on leftovers, credit card bills and your children’s homework than loving affirmations. And instead of focusing on the positives, the stability, our spouse’s good traits, it is easy to focus on the lack of affirmations. We begin to view our marriages as “unhappy” since we’ve been running around and not having tons and tons of happy moments. So when that quote came on the radio, it was a stark reminder that my perspective has been flawed. And then, as I was thinking over what the ultimate goal of marriage is, a few hours later, our dog started acting very weird. Like she was dying. The dog we’ve had for 12 years, the one we got a few months after we got married. We took the dog and our two children to the vet. As my husband was wrangling the kids in the waiting room, I met with the vet. As she started telling me what was wrong with our dog (she was dying of cancer), I literally couldn’t handle it. I stopped the vet, and told her that I wasn’t capable of handling this kind of thing, and that my husband was better at it. I ran out of the room, and sent my husband in. As I waited with the kids, he stepped out and told us the vet recommended putting our dog to sleep. As the kids and I started crying hysterically, my husband hugged and comforted us. We all said goodbye to the dog, and then me and the kids went to a separate room while my husband stayed with the dog as they put her to sleep. Afterwards, as my husband (who obviously was also distraught) still drove us to ice cream and comforted me and the kids, I had an epiphany. This is what marriage is about. Not endless kisses and affirmations. It is the acknowledgement that in the hardest moments of our lives, I can completely depend on my spouse when I am unable to handle things. We know that the Bible talks about unity as a goal of marriage: “Therefore a man shall leave his father and mother and hold fast to his wife, and the two shall become one flesh” (Ephesians 5:31 ESV). It doesn’t say a man shall leave his parents and shower his wife with happy moments. It doesn’t say that a man shall leave his parents and say loving things every single day. 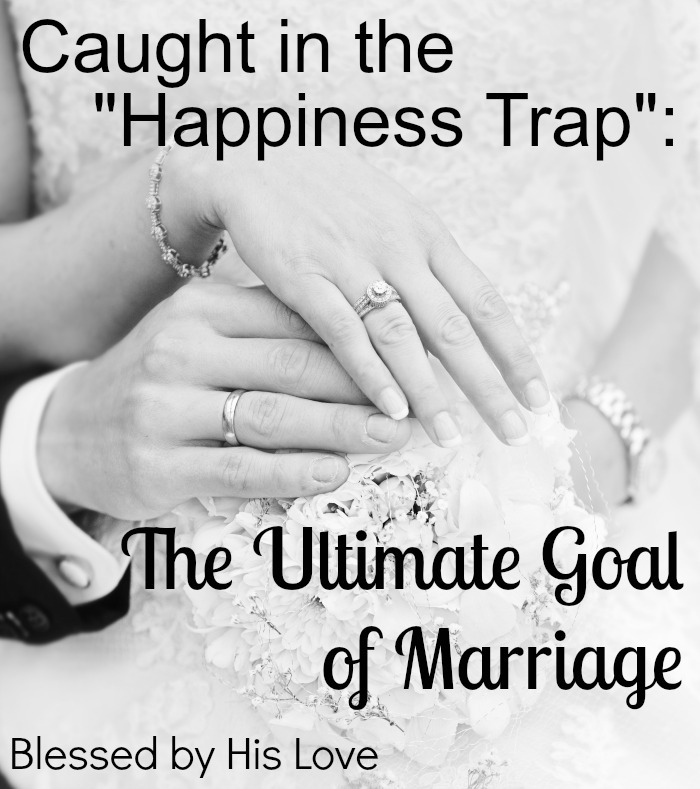 It doesn’t tell us the end goal of marriage is happiness. Or endless attention and validation. The goal is that we will hold fast to each other and become one flesh. We will find unity. That when we hurt, our spouse hurts. When I’m weeping, my spouse’s heart breaks and vice versa. I’m sure if you asked fifty people on the street what the goal of marriage is, they would have wildly different ideas. Stability. Support. Unconditional love. Someone to talk to. Happiness. A travel partner. I think a great marriage includes all of those things, but ultimately we are obediently following God’s call to create unity – two people working towards the goal of having a stable marriage full of love for God, support and unconditional love for each other. My husband said that just as the goal of our relationship with God is not happiness (“if God blesses me enough and I feel happy, I’ll keep following him”), but a dependence on the blessed assurance that God has promised us unconditional love, support and eternal life; our goal for marriage should be the blessed assurance that we can depend on our spouses for unconditional love, support, and a fulfilling life. For me, it is the knowledge that I can depend on my spouse is the dark moments. When we are putting a dog to sleep, struggling financially or when my dad had health issues two years ago. Because let’s be honest, happiness is an awesome benefit of marriage. But as we are married for longer and longer, things get harder and harder. You lose pets, grandparents, and then parents. We deal with health issues, back pain, cancer or diabetes. My husband shared about an elderly couple that he knows. They’ve been married forever and as her health is failing, her husband helps her into the bathtub and gets her dressed every morning. Do you think she would trade that unconditional love and support for a few fleeting happy moments? No. Because as we get older, we value consistency, support and love in the face of the ugly or weak moments. If we focus on happiness as the end goal, we will be disappointed. Even the best, strongest marriages have less than happy moments. But remember, just because there are tough, less-than-happy moments, doesn’t mean you have an “unhappy” marriage. And if you are truly struggling and are having so many unhappy moments that your marriage is falling apart, seek help. Find a marriage counselor. Meet with your pastor. Pray fervently. Find an older couple to mentor you. For me, it was simply changing my focus from wanting “happiness” to finding joy in the stability of my husband. Putting our dog to sleep was one of the hardest moments of our marriage (so far), and yet I knew I could depend on him fully to make decisions when I was an emotional wreck. So for those of you, who like me, have gotten stuck in the “happiness trap,” shift your focus. You might be surprised how much it helps you. And ultimately, I love you Jesse, my wonderful husband. Thank you for being my rock, my support and loving me unconditionally. I can’t imagine walking this winding, difficult road with anybody but you. I really liked this post. The idea of happiness is something I believe our society "buys into" because of selfishness. That is, when our focus is on God rather than man, everything is in perspective. God provided us marriage as a gift to understand Him, each other, and then ourselves. Happiness doesn't make us who we're intended to be. Thanks for the thoughts! Very nicely done. Happiness is a trap. We are called to be content not happy. Beautifully put. Happiness is about us. Unconditional love and support is about the other. This is true love in action. Thanks for this post. I have heard about complete church lenders directory which is very helpful to shortlist the lenders that are compatible for solving any versatile and challenging problems and also for fair costing church financing. It's very reliable, easy to understand and helps in deciding the best. exactly, happiness lies in contentment. Our church does a social activity; brought up orphan children and shelter the widows. In times of our crisis, we need fair costing church loan for a short period. Griffin Church Lenders provide us that. The One Discussion Parents Need to Have with Their Children…but aren’t.